The cosmetics company reveal their latest Christmas collaboration with artist Andrew Bannecker. It’s that time of year again. The Oxford Street decs are up, lighting up the calm before the storm of Black Friday bargain hunters and last minute Christmas Eve shoppers. If, like us, you’re far too busy re-watching Love Actually and drinks hopping to spend a few days frantically searching department stores, look no further for all your gifting and personal skincare needs than Kiehl’s Holiday Collection. Each year the cosmetics giant teams up with a different artist to create unique limited edition packaging designs on a selection of products. This year their partner of choice is American illustrator and artist Andrew Bannecker, known best for his vibrant colour combos, quirky characters and textured designs. For a stand-out stocking filler, pick between the green Coriander, lilac Lavender and refreshing red Grapefruit variations of Kiehl’s Gentle Exfoliating Body Scrub Soaps. 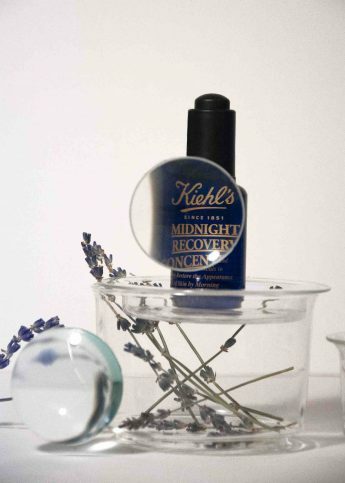 But first, you’ve probably got a hangover to hide… Cue bestseller Midnight Recovery Concentrate, made from lavender essential oil, primrose oil and Kiehl’s signature ingredient squalane, derived from olives, which enhances your skin’s natural nighttime recovery process. Apply whenever you slip off your party shoes and wake up looking deceptively sparkly and revived. Freshen up the next day with Kiehl’s Calendula Herbal Extract Toner, a gentle formula containing calendula petals and burdock root to wake up dry, tired skin. The Ultra Facial Cream hydrates and helps protect the skin throughout the winter, and this year features a peel-back label to reveal a various characters determining different prizes, including three luxury deluxe samples, a red Kiehl’s canvas pouch and a Holiday 2018 tote bag. Here to revive you before NYE is Crème De Corps Soy Milk and Honey Whipped Body Butter – a light, air-whipped potion, or the classic intensive Crème de Corps body butter, a high-concentration cocktail of skin-nurturing ingredients like shea Butter, avocado Oil and squalane, which Kiehl’s promise will give your skin a complete glow up within 10 days of use. And finally, for that rom-com moment under the mistletoe you’re going to need with Kiehl’s Butterstick Lip Treatment, which blends coconut oil with antioxidant lemon butter to keep you glossy and hydrated all season long. Their limited edition Skincare Set includes the Midnight Recovery Concentrate, Calendular Foaming Face Wash, a Powerful Strength Line Reducing Concentrate and Kiehl’s Deluxe Ultra Facial Cream, all for £47.50. Kiehl’s Hair and Bodycare Set includes an Amino Acid Shampoo and Conditioner, as well as the famous Crème De Corps and Crème De Corps Body Cleansing Oils, for £34.00. Their Men’s Set (a perfect solution to the inevitable struggle for Dad presents) features a Facial Fuel Cleanser, Facial Fuel, Body Fuel Wash and Deluxe Age Defender Power Serum, retailing at £31.00. The Exclusive Set includes a Facial Fuel Cleanser, Facial Fuel, Smoother Glider Shave Lotion and Deluxe Body Fuel, all for £42.50. All gifting comes with a complimentary gift wrap and a festive red box for anyone who buys in store over Christmas. Products are available online and from all Kiehl’s retailers (not boutiques). Kiehl's have upgraded their ride-or-die beauty staples, and we're (even more) obsessed.